For the first time at the Marine Equipment Trade Show (METS), leading panel mounting innovator Fastmount will debut the new Textile Range, alongside new clip prototypes. The Textile Range TC-06 clip set was designed to revolutionise the process of removing and replacing deck cushions on superyachts for captains and crew. Made up of the male TC-M6 and female TC-F6, the easy to install clips allow the user to simply align and click deck cushions into place, with a perfectly aligned and secure finish. Celebrating their 10th year at METS, Fastmount has designed three new male clip prototypes to complement the Textile Range, working seamlessly with the TC-06 clip set, which was released in May 2016. Having listened to market feedback, Fastmount developed a transparent prototype of the original screw-fix male TC-M6 clip. The TC-M6CL is made of clear, UV-resistant plastic to improve aesthetics on deck when the cushions have been removed. This option will be particularly useful in cockpit seating areas that have teak decking instead of a gelcoat finish, as the clip is able to blend into its environment. Also seen for the first time worldwide will be the prototype of the Textile Range surface mount male clip. The surface mount can be used as an alternative to the TC-M6 or TC-M6CL to avoid screwing the clip into the deck. It will be available in both the standard white (TC-SM6), which is ideal for gelcoat finishes, and a transparent plastic (TC-SM6CL) for use on different coloured decks. The UV stabilized clips have a VHB adhesive backing to securely mount the clips to any painted surface. As a part of their METS stand, which is constructed using Fastmount clips, Fastmount will also debut the fire-rated version of the popular Very Low Profile clip: VL-03FR. 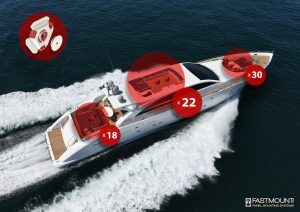 Made of a highly fire rated compound (UL94 V0 rated), the VL-03FR can be easily integrated into any yacht that requires fire rated materials. The VL-03FR has a pullout load rating of 8 kg per clip set. Fastmount Directors Gregg Kelly and Maggie Kelly will be at the Fastmount stand during the show, supported by European agent Dominique Gauduchon, Australasian agent Gregar Haycock, and communications manager Maxine Kelly. Five out of Fastmount’s 25 distributors will also exhibit at METS, marking the biggest ever representation of Fastmount distributors at the show. Fastmount will enter the Textile Range into the DAME Design Awards, the most recognized design award for marine equipment and accessories. Fastmount has previously received two DAME nominations in 2007 and 2013. The TC-M6CL, TC-SM6, TC-SM6CL and VL-03FR prototypes will be demonstrated at the Fastmount stand in the New Zealand Pavilion, Stand #02.224. Fastmount looks forward to welcoming you to their interactive stand, so that you can try for yourself the ease and simplicity of the Textile Range.